The invention of the ringing simulator in the late 1970s was probably the biggest potential advance in ringing training of the 20th century. Despite this, they are still only fitted in around 1 in 20 towers, and many of those are probably not used as teaching tools, but as a means of providing cheap sound control. This page explains how a simulator works, with practical advice on how to acquire, install and use one. The bell – This can be a normal bell with the clapper tied or it can be a dumbbell – a weight fitted with wheel and rope, and hung so that it behaves like a bell. 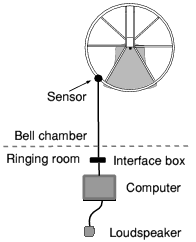 The sensor – This detects the movement of the bell. In most modern simulators the sensor detects when the bell passes through the down position, and the simulator calculates how long after that the strike point is. Older simulators detected the two points at which the bell would actually strike (one for handstroke and one for backstroke) and had a circuit to ignore the detections for the ‘other’ stroke. An interface box – This converts the signal from the sensor into a suitable input to the computer. A loudspeaker – This makes the sound for the pupil to hear. The computer may have a built in speaker, but if that isn’t loud enough, a more powerful external one can be plugged in. To enable more pupils to practice at the same time, and to provide the ability to practice on bells of different weight, a simulator installation can have more sensors and more computers. The diagram shows three of each, but the number doesn’t have to be the same. 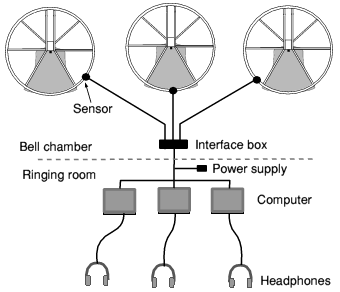 Many towers fit a sensor to each bell, which gives complete freedom of which to use, and choose the number of computers based on how many pupils they want to be able to ring at once, or possibly other constraints such as space or cost. In order to reduce the number of cables running down the tower, there is an interface box in the bell chamber that combines the signals from all the sensors to go down a single cable. The interface box needs its own power supply, but this is normally in the ringing room (where it is easier to switch on and off) with the power sent up the single cable. The pupils need to use headphones, because each of them is effectively ringing in a different simulated tower. The cable to the headphones should normally run down the pupil’s back, ie well away from the rope. With two simulators it is possible for one pupil to use a loudspeaker (providing it isn’t too loud) and the other to use headphones (providing they exclude external sound). The bell that is suitable for the pupil to ring might not be near the place where the computer can be located. That problem can be solved by using wireless headphones . Various forms of wireless headphone are available, using several different technologies (infra red, radio frequency or Blue Tooth). RF or IR headphone systems often come with only two switchable channels. You could combine two channels of RF with two channels of IR to have four simulators running at the same time. Or you could combine two wireless channels with one or more wired channels (ie headphones plugged in directly). Bluetooth can handle up to 8 independent devices, so when they become more common that might offer a better solution. The tutor can’t hear the sound when the pupil is using headphones, so can’t listen and advise as the ringing progresses. You could obtain some sort of splitter or junction box to allow the tutor to plug in as well. If you are using wireless headphones then the tutor can listen in using an extra set. And if you are using two channels, the tutor can switch between them. In the early days of simulators there wasn’t much choice – you obtained ‘a simulator’ with a sensor connected to ‘a bell’. With the advent of multi-bell interfaces, the use of (usually free) computers, and the capability to connect several at once, there are far more choices. The cheapest way to acquire a simulator is still to buy (or make) a single sensor and connect it to a single computer running simulation software. If that is all that you can afford, then it is far better to do that than not to have a simulator available as part of your teaching. More sensors – If you buy a multi-bell interface box with your initial sensor, then you will be able to plug in more sensors on other bells as and when you need them. You might want to do that to give you a choice of bell weights for simulator training, or you might want to increase the number of simulators. More computers – If you buy your initial system with outputs to more than one computer it will save you having to buy an additional expander box later. If you have more than one simulator, then you will need to decide what type of headphones to provide. The layout of your tower will probably determine whether you opt for wired or wireless headphones. Your choice of wireless headphones is likely to be influenced both by the number of independent channels that you need, and by what products are readily available at a reasonable price when you are making the decision. So you will need to shop around and do some research. Simulator software is available from several sources, mostly for computers running Windows. The interface from the sensors to the computer is likely to be a multi-pin connector intended for the computer’s Serial Port. All older computers have a serial port connector, but some modern ones don’t, in which case you need to buy a Serial Port to USB adaptor for each that doesn’t. Before you order the equipment, make sure you know where everything will go. Decide where to locate the sensors and how you will fix them to the frame. You may get permission to screw the heads to the frame, but a non-invasive fixing is generally preferable, since it is completely reversible. Some people have used tape, while others have used garden wire, which is a bit more fiddly to fit but is more durable. Decide where you will put the interface box and where you will run the cables. Everything needs to be secured where it won’t get caught, knocked or trodden on by people walking round the frame and climbing in and out of the bell pits. Work out the route of the cable between the bell chamber and the ringing room – where will it go through the floors, how it will be supported and how to protect it from any damage. In the ringing room, work out where you will put the computer(s) and how you will get power to them. With several computers, headphone charger/transmitters and the power supply for the sensors, you will have a lot of equipment, with a lot of cables and plugs. When you know where everything will go, work out all the cable lengths that you will need. Make sure you have enough, but not so much that you will have a problem stowing the excess tidily. The physical installation of the equipment shouldn’t present any problems to anyone used to moderate DIY, providing you have planned where everything needs to go. If you are using optical sensors they need to be pointing at the middle of the wheel rim, a few inches away. Don’t put the reflective strip on the wheel until after you have connected everything up and applied power. Then with the bell down and stationary stick the reflective strip so that its centre is in the middle of the spot of light from the sensor, and align it so that the light will pass across its shortest dimension when the wheel turns. If you are using other types of sensor the detail will differ, but the idea is the same. If you have an older type of simulator that uses two separate reflective strips, then you need to position them so they pass the sensor at the time when the bell would strike. If the sensor is below the pivot, then one reflector needs to be near the garter hole, with the other at the same height on the other side of the wheel. With the sensor in a different position, you need to do some measurement. Installing the software should be no more difficult than with any other software, but since modern simulator software offers so many options and capabilities, you will need to spend some time familiarising yourself with it. With a serial port, you probably need to set the port number in the range COM1 – COM4, but if you are using a Serial to USB convertor you might need it to be in the range COM5 – COM8. The software will probably come with default delay settings. The delay is the time between the when the bell passes through the mouth-down position and when it strikes. You can adjust this, but for an average bell you might not need to. Ring each bell and see if it strikes normally. If it does then you can leave the default setting. If it seems to strike too late or too early, then decrease or increase the delay accordingly until it seems OK. For basic simulator training it doesn’t matter whether the timing exactly replicates what the real bell would do. If you want to use the simulator as ‘electronic sound control’ when ringing all the bells together, then you have a choice. You don’t have to replicate any quirks of the real bells, but if you do want ringing with the artificially generated sound to feel more like ringing the bells open, then you can match the delays to what the real clapper does by ringing the bell with the simulator on and the clapper open and adjusting the delays until the sounds coincide. Most current simulator software doesn’t let you adjust the odd-struckness of individual bells, so you are likely to end with a compromise anyway. Different simulators offer different facilities, so these notes can only be a guide to what is possible with the one you use. When using a simulator, you have two separate choices of ‘which bell to ring’. The physical choice you will make on the basis of weight, rope behaviour, etc, as you would for solo bell handling, but you also need to choose which simulated bell your pupil will ring (ie which sound out of the ones being produced). Many pupils find it easier to start by being the Tenor. That might be because they hear the row start before pulling off or it might just be being at the end of the row, which is easier to pick out. Some pupils find it harder to listen to the Tenor because the backstrokes are followed by an extra large gap, in which case the 5 (if you are ringing 6) might be a good choice. In any case, once your pupil has got used to ringing with the simulator, you should vary the bell rung in order to develop the habit of ‘ring in the same place unless I hear an error, in which case make a small adjustment’. Let the pupil pull off and ring the bell until he/she is comfortable, then start the simulator, using your judgement to start it at the right time to fit in. You may need to make manual adjustment to the simulator speed if it is too far from what the pupil is comfortable with. This method works well with a pupil that takes a while to settle down on the end of the rope. Start the simulator and let the pupil join in with it. That requires the pupil to judge the appropriate time to pull off, possibly with the help of your prompt. If the pull-off is too late or too early, you may need to prompt the pupil to get in the right place, as you would if he/she drifted too far out while ringing anyway. This approach encourages pupils to develop the knack of pulling off at the right time, and in fact many do so quite quickly. If your simulator has an auto-start facility you can let the pupil start ringing and the simulator will automatically join in after a couple of whole pulls. This approach avoids either you or the pupil having to judge the start, since the simulator takes both its start time and speed from the speed of the pupil’s first few blows. It works less well if the pupil rings the first few blows unevenly, which many of them do, because the speed derived from these first few erratic blows may be much too fast or too slow. With a simulator you have complete freedom to let your pupil ring for as long or as short a time as you judge most useful. No worry what it sounds like outside (it doesn’t) nor about what the other ringers will think (there aren’t any). If the pupil gets off to a bad start, you can just as easily stop and start again as struggle on. If you see a problem emerge during the ringing you can stop and discuss it while it is fresh, rather than expecting the pupil to remember what was going on afterwards. But providing the ringing is going well, you can let the pupil continue ringing as long as he or she wishes to do so. Make it clear that asking to stop is OK. 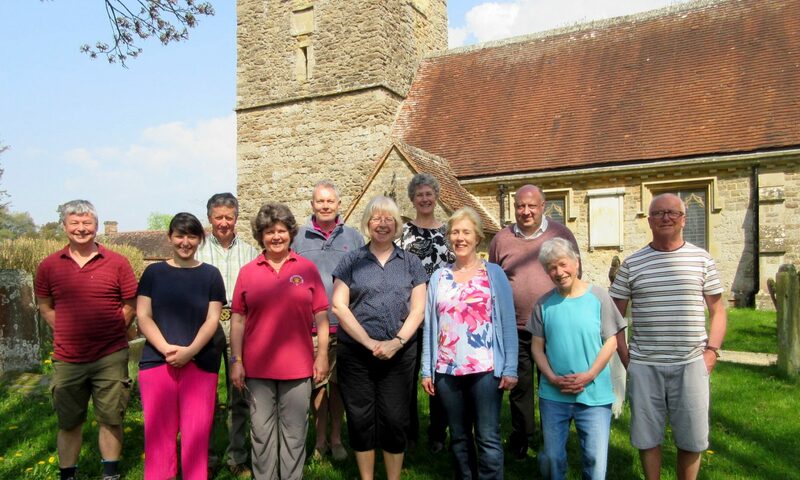 If you decide to end the ringing, you may want it to end ‘on a high’. For example don’t stop during a difficult patch when your pupil might not be able to set the bell on demand. On the other hand, if the pupil is struggling – the striking is getting worse, and/or the pupil is showing signs of distress of fatigue, then it is better to stop sooner than later. Ideally the simulator would stop at the next handstroke when you tell it to ‘stand’ but some simulator software works by giving its own command to stop a whole pull after that. If yours does that, you will have to get used to the slight frustration of not being completely in control. Pupils often have some common problems when ringing with a simulator. These are usually problems that they have when ringing with other ringers, but in the absence of visual cues they may be more pronounced, and with the other bells ringing perfectly, they are more prominent. See common problems . When your pupil is reasonably steady at his or her ‘natural speed’ deliberately vary the speed of the simulator (faster and/or slower) in order to give practice ringing at different speeds. Ringing slowly or quickly (relative to the bell’s natural speed) broaden your pupil’s range of control and ‘comfort zone’. If you have sensors on more than one bell, get your pupil to ring different bells too. You can also introduce an element of ropesight by including another ringer on the bell that the pupil is following. The other ringer must strike accurately, or it will disrupt the pupil’s listening and rhythm. Note also that getting used to seeing the rope being followed is only a tiny part of learning ropesight, which is about ‘reading’ how you fit in among all the other ropes. The backstrokes are worse than the handstrokes, because the pupil doesn’t adjust the grip on the tail end. So when hunting down the backstrokes are too slow, and when hunting up they are not slow enough. Thus even if the pupil gets the first (handstroke) blow of the hunting right, the second (backstroke) blow isn’t quite right. The next blow might recover, or the cumulative error might build up to the point where it is so large that the pupil can’t get back on track. The simulator that you use may provide other useful facilities that you can use while training, so read the manual.